If you are finding it increasingly difficult to safely enter and exit your tub, an AmeriGlide bath lift may be the perfect solution. Unlike other available options, a bath lift does not require any home modifications or bathroom renovations. You can have your lift installed and up and running in just a matter of minutes. Operating your lift is even easier! With the push of a button, you can raise and lower yourself in and out of your tub and enjoy a warm relaxing bath. 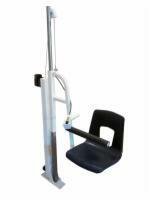 Relieve stress, reduce pressure on your muscles and joints, and prevent bathroom falls with an incredibly affordable bath lift from AmeriGlide of Southport, North Carolina. Call or visit our local showroom to get started today.